There is no question that dining on a Royal Caribbean cruise has become a major aspect of the cruise experience. The food available onboard ranges from simple and classic to extravagant and contemporary. In short, there are a lot of great dining choices available on Royal Caribbean. With so many choices, often guests preparing for their cruise have many questions about what is included, which options are available and how it all works. What follows is our guide to understanding better the basics of dining on a Royal Caribbean cruise. Simply put, there is plenty of great food included in the cost of your Royal Caribbean cruise. One can easily go an entire food and enjoy nothing but food that has no additional cost from morning to night. After all, that is what the concept of a cruise has been for a long time. Royal Caribbean ships have different names and venues for its dining options, but you will find some basic characteristics among them all to prepare you for what to expect. 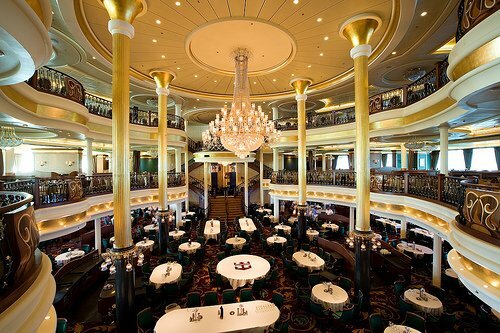 The main dining room is the stalwart and institution upon which cruise ship dining was established. It has changed over the years, but the principles remain the same and is available on all Royal Caribbean ships. Guests may dine in the main dining room for dinner every night and breakfast every morning. Lunch is served in the main dining room on sea days only. The basics of the main dining room are it is a large, sit-down restaurant with waiter service that is included in your cruise fare. For dinner, Royal Caribbean offers a traditional set time with assigned seating, or an alternative first-come, first-served option (My Time Dining). Both offer the same menu, which changes every night and in both cases, there is the possibility that you will be seated with other guests. Dinner is the most popular and common time to dine in the main dining room, when the main dining room offers appetizers, entrees and desserts to choose from each night and you may order as much (or as little) as you like and it's nearly all complimentary. The exception for food that is not complimentary in the main dining room are a few premium dishes that have an additional surcharge and premium beverages, such as soda, alcohol and specialty coffee. Breakfast and lunch is less formal than dinner, with guests seated as they arrive, with posted hours of when the dining room is open. In both cases, the meals are served to you at your table. The breakfast menu does not change, but the lunch menu does. 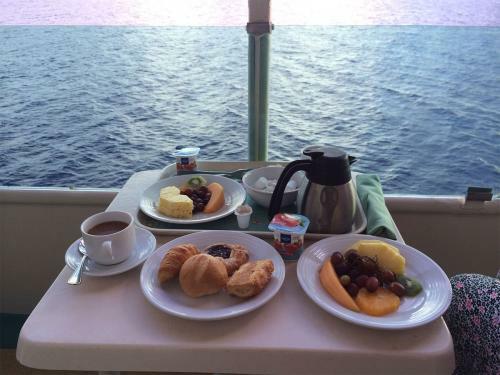 On Empress of the Seas, breakfast is sometimes replaced by a brunch option. The main dining room has a dress code. Dinner has a dress code that changes each day, while breakfast and lunch have a more casual dress code requirement. When guests hear the word, "dress code," that often causes a lot of concern about what to wear. The reality is on most nights, guests can easily wear what would be defined as "resort casual," which can mean a sundress or skirt for women and a collared shirt and slacks for men. "Nice" jeans are appropriate for both men and women too. On formal nights, the suggested attire gets a bit fancier, with cocktail dresses or gowns for women and suits for men. First time cruisers often imagine a large buffet when they think of eating on a cruise, and the Windjammer is the closest thing to that concept. The Windjammer Cafe is a buffet restaurant that is included in your cruise, which serves meals throughout the day. Most are not open all the time, but have long enough hours to cover nearly all the times guests would like something to eat. The Windjammer has lots of seating and even more food variety than anywhere else on the ship. You will find burgers, soups, sandwiches, ethnic dishes, salads, pastas and much more every day. Guests will find the greatest variety of food at the Windjammer compared to any other dining location on the ship, complimentary or paid. Guests serve themselves from the buffet and then bring their food to a table in the area. Guests are also free to take their food elsewhere on the ship, like the pool deck. There are wait staff who will clear plates, clean tables and bring you drinks. Unlike the main dining room, the dress code for the Windjammer is casual. The Windjammer is a great alternative to any sit down restaurant, including the main dining room. Some guests opt to eat exclusively at the Windjammer for dinner instead of the main dining room for a variety of reasons. The bulk of complimentary food on a Royal Caribbean cruise is available from quick service restaurants, which offers prepared and short-cooked food to guests. The sort of food you find here are sandwiches, snacks, pizza and everything between. Each Royal Caribbean ship will offer a number of these locations around your ship, so you are never too far away. There is usually limited seating available at these locations, but most guests go into get the food and then bring it somewhere else on the ship to eat, such as their stateroom or by the pool. It is designed for guests that want something quickly to eat on their way to somewhere else. Room service is available 24 hours per day on your Royal Caribbean charge. Since March 27, 2017, Royal Caribbean charges a $7.95 per order fee for room service. This means, whether you order one item or ten items, a $7.95 fee per room service order will be levied. A complimentary continental breakfast option remains complimentary and will not incur the $7.95 fee. Just like room service at a hotel, you can call room service and place an order to have a crew member deliver the food to your room. Royal Caribbean has also added a room service ordering option via the stateroom television, which simplifies the ordering process. The room service menu does not change and is limited in scope. In addition to all the food that is included in your cruise fare are specialty dining options, that carry with it an extra cost to enjoy the food there. The exact amount extra will vary from restaurant to restaurant, and ship to ship. In most cases, the specialty dining options offer a greater variety of food choices than what is available at complimentary dining locations. Royal Caribbean has designed its specialty restaurants around themes or cuisines (Italian, steakhouse, sushi, etc). Royal Caribbean recommends making a reservation in advance for its specialty restaurants to ensure there is a seating available, but there is usually walk-up availability although there is a greater risk of waiting to be seated. Unlike the main dining room, you will not be seated with other guests with the exception of the Izumi Hibachi experience. Specialty restaurants are priced in one of two manners: cover charge or a la carte pricing. With a cover charge, there is one price for all the food on the menu (except for beverages). There can also be a surcharge for ordering more than one entree, although this rule varies based on the specialty restaurant you happen to be dining at. A la carte dining charges you just for what you order, and is similar to how food is billed at a conventional land-based restaurant. Specialty dining can be booked prior to a cruise via Royal Caribbean's web site or once onboard the cruise. Reservations made online for a specialty restaurant with a cover charge will charge that amount at the time of booking. Reservations made for specialty dining onboard your ship will not be charged to your SeaPass account until you dine at the restaurant. The cost of specialty dining varies considerably and we even see different pricing across the fleet. Most specialty dining has a flat-fee surcharge, ranging from $6.95 (Johnny Rockets) or $25 (Giovanni's Table) to $85 (Chef's Table). Most specialty dining restaurant cover charges fall into the $20 to $45 range. The a la carte priced restaurants will have item prices of just a few dollars to around $20. All Royal Caribbean specialty restaurants are open for dinner, with some open during breakfast and/or lunch. Lunch meals at specialty restaurants usually are priced a bit lower and only on sea days. Breakfast is quite rare to be offered at Royal Caribbean specialty restaurants. Some specialty venues, like Johnny Rockets on Oasis-class ships and Chops Grille, transform to offer breakfast for no additional fee. For breakfast or lunch, advanced reservations are not usually available nor required. Royal Caribbean welcomes children that are 13 years old or younger to its specialty restaurants (when accompanied by an adult) and even offers them special pricing. Kids ages 6-12 can dine at specialty restaurants for a $8 cover charge. Kids 5 years old and under eat free. In fact, some specialty restaurants have a special kids menu, which kids can order off that offers kid-friendly favorites from the regular menu. Children under the age of 5 will have a menu similar to the kids menu from the main dining room. Royal Caribbean does recommend, but does not restrict, Wonderland Imaginative Cuisine, 150 Central Park, and Chef's Table are best enjoyed by children 13 years or older. Royal Caribbean is very accommodating when it comes to guests who have special dietary needs. The cruise line can handle a number of requests, such as food allergies, Gluten-free, Kosher, Low-fat, and Low-sodium. Lactose-free/soy milk, Ensure, and kosher meals are available no extra charge. All you have to do is notify Royal Caribbean at least 45 days prior to sailing (90 days for European/South American Itineraries). For any and all dietary requests, contact your travel agent or Certified Vacation Planner and request that the remark be noted in your reservation details. If you made your reservation online at royalcaribbean.com you may add your request to the "update personal information." section. You may also send an e-mail request to special_needs@rccl.com; please include in the e-mail the guests' names, booking number, ship name and sail date. E-mails will receive an automated response.